After the week-end the snow cleared really quickly except for a few places where it had been blown into large drifts. 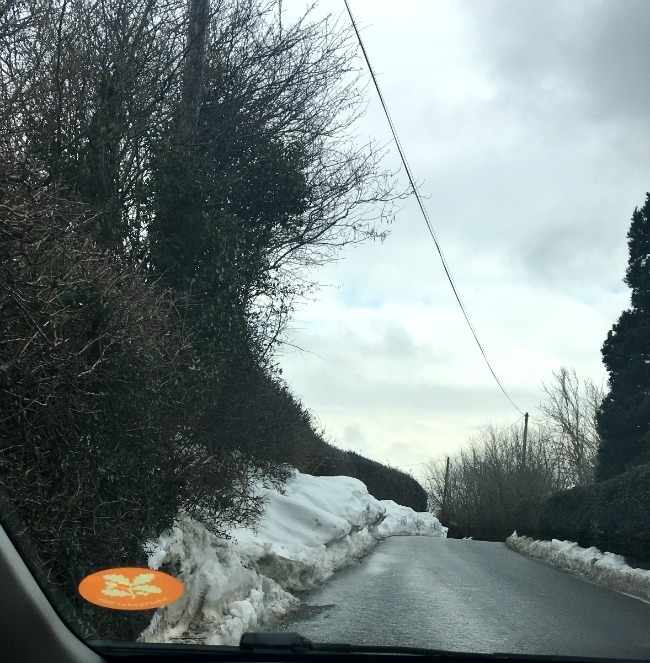 Our school run, down a narrow lane, was made a little trickier by the snow that had drifted and partially blocked one side. 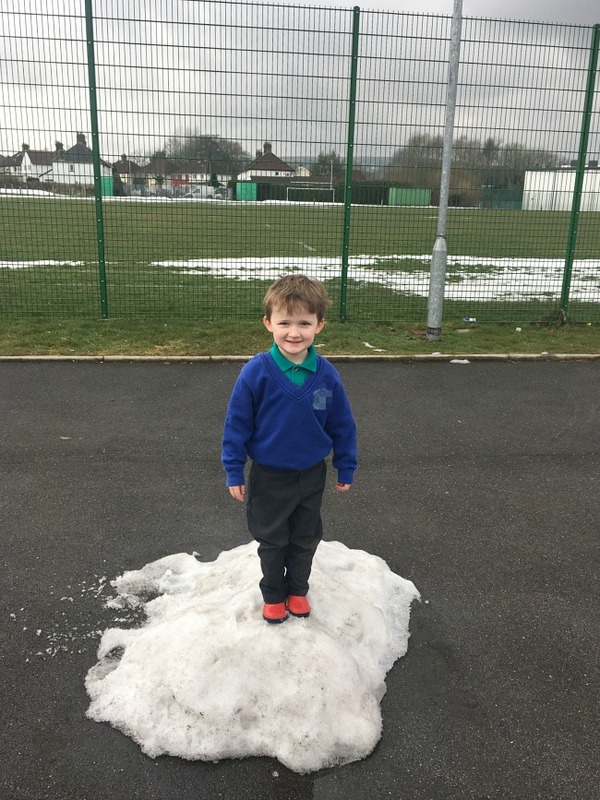 Bear was really pleased to find some left outside his school. On Wednesday it was almost like spring, so we took advantage of the sunshine and went to our favourite park, Roath Park. 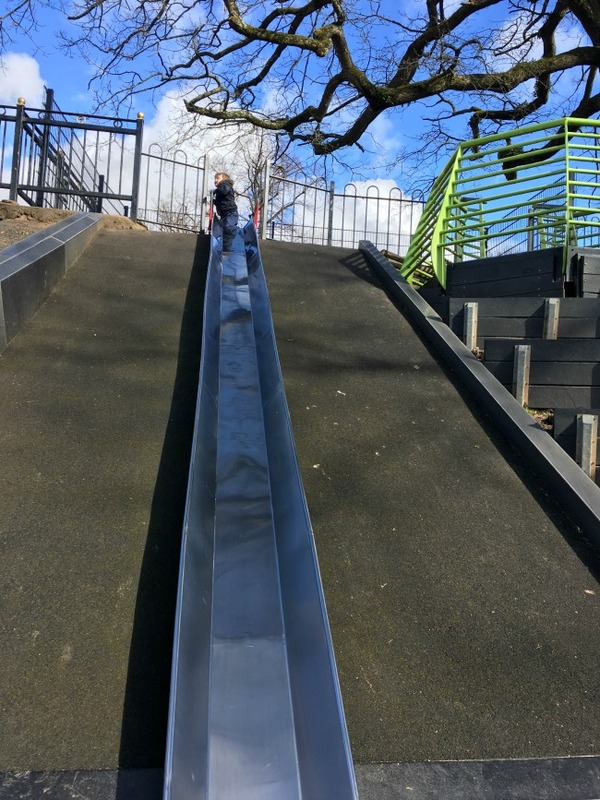 It has the best slide - it is really high but built on a hill so never more than a foot from the ground. This makes it fun for children of all ages. It has a ramp up each side that Bear was keen to climb. 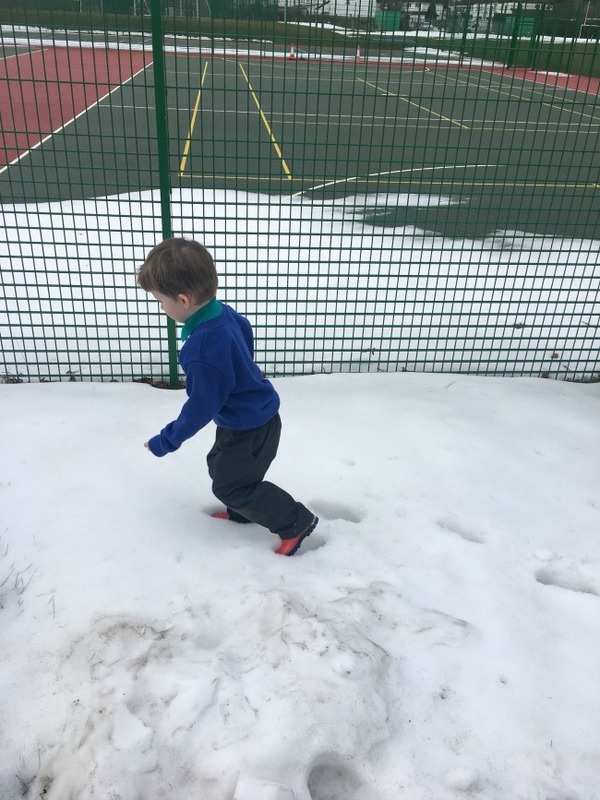 I have always stopped him because there are usually lots of children around and I worry one may get pushed and tumble down. It was relatively quiet so off he went. He was fine for most of the way up and then got stuck. I am not the most nimble of people but had to scramble up to rescue him, thinking that it would be funny if I got stuck too. Bear is usually quite adventurous, he even had a fit of crying (when a girl went down the slide ahead of him) which was totally out of character. I'm hoping he was just over tired and not the start of another bug. 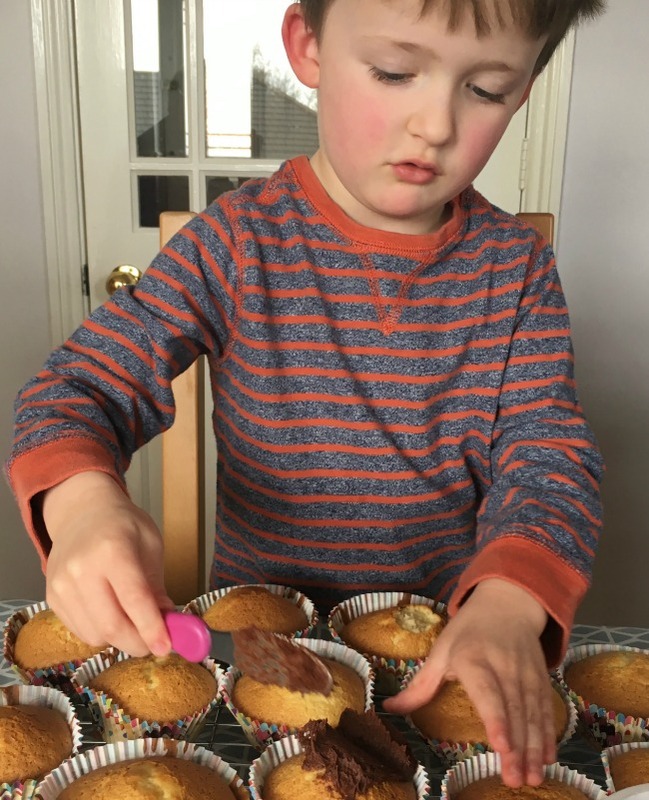 We had been sent a few items for Easter to review, so spent one afternoon making Easter fairy cakes. Bear loves cooking, he now knows what comes next and I need two pairs of hands to keep one step ahead! 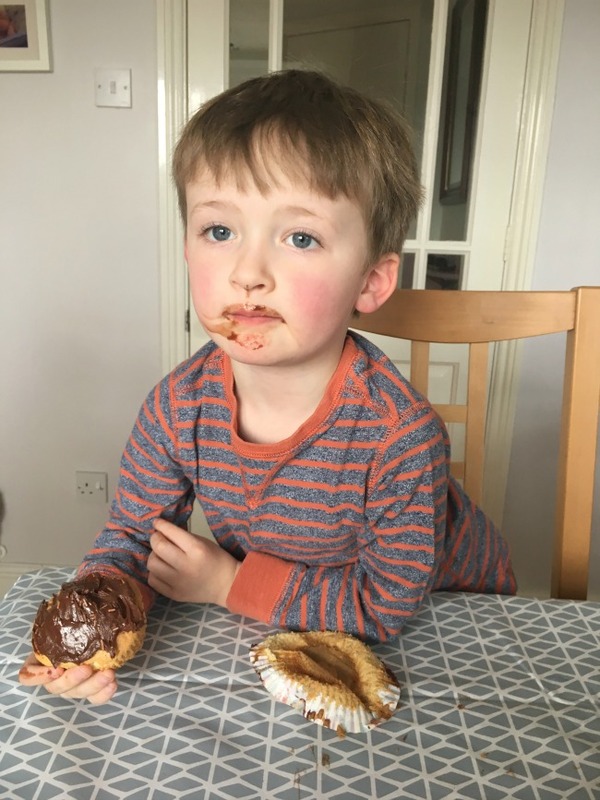 He doesn't even like cakes, but a few weeks ago he started to enjoy chocolate cake, his absolute favourite are chocolate rolls. So we decided to decorate with chocolate icing. You will have to wait until later in the week to see our masterpieces! If you look closely you'll see a cake has been nibbled haha! 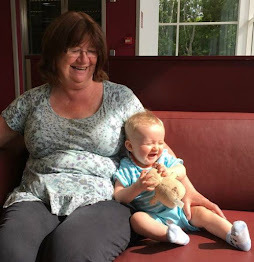 On Thursdays I go to Bears house and baby sit Bee while his mummy has a driving lesson. I love this time alone with Bee. Sometimes he sleeps, sometimes he looks at me with suspicion, but usually as long as he is fed he is a delight. Being a breast fed baby he doesn't like bottles. If he is sleeping when his mummy leaves, he will need a feed before she gets home. I always have expressed milk available but as the weeks have gone by Bee has refused the bottle totally. Screaming at me! Mummy bought different teats and he loved it. He is only six months old but he knew what was in the bottle and tried grabbing it from me. Once he had finished, I put it on the sofa next to me and he pulled and squirmed to get it. I let him go and he grabbed the bottle and tried to feed. 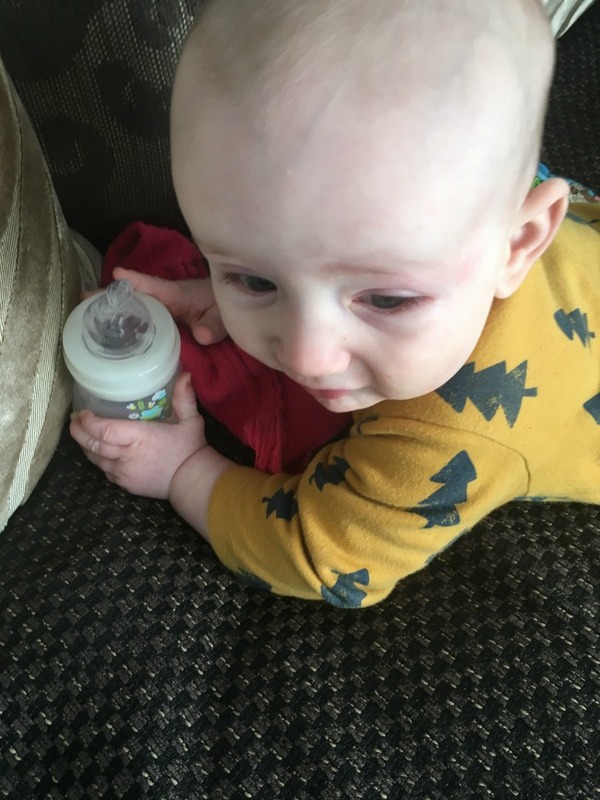 I know this is common with formula fed babies, but he has hardly had a bottle. He is also pulling himself up. He can stand unaided and I think he will take after his aunty. She walked so early, I think he will too. Finally the saga of the TV. We have a small 32" TV in the lounge. 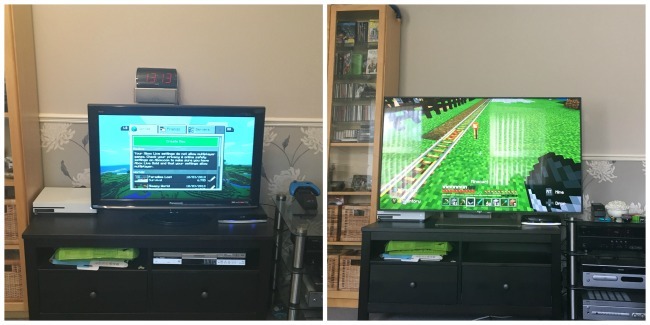 We have been looking at getting a new smart TV for ages and finally agreed on the one we wanted, somehow the size of the TV just kept going up. I checked viewing distances and so on and we bought a 55" TV. It's HUGE - I mean really HUGE. It took over the room, and made me nauseous watching it. It had to go back. Luckily we had bought it online (so have a 14 day return) and from Richer Sounds. Their after sales service is excellent, I didn't have to explain or convince them to take it back - they talked me through the whole process. Back to the drawing board - we still need a new TV but what size? I want a 43" but hubby wants 49" (he loved the 55" TV) and I know he's sad to see it go. Yes, that is Minecraft. We are both addicted to the game.